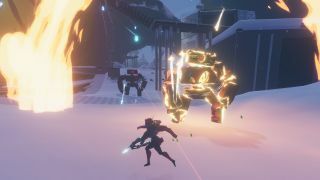 Risk of Rain 2's latest update delivered highly requested changes to two incredibly annoying enemies. True to its word, developer Hopoo Games toned down the blazing modifier on elites. Blazing enemies now deal less burn damage overall, and you'll be able to tell how much burn damage you're taking from the burn stack counter in your buff bar. "Overall this should make the burns way less bursty and way more consistent, also allowing heal over time effects to help counteract the damage," the studio said. "The intent is NOT to make the entire game easier, or to make burns never kill you. Fire elites are the only purely offensive elite-type, so they should be causing deaths. It should just feel less BS now." Speaking of flaming enemies: the Magma Worm, a stage boss which previously took way too long to kill, has been reigned in. Its armor was lowered, for starters, but more importantly it will now spend less time flying through the air. Hopoo followed the community's suggestion and added an alternate movement mode in which the Magma Worm will crawl along the ground, making it much easier to attack. To offset these flaming nerfs, the update also reworked the ice and lightning elites to make them more deadly. Ice bombs now deal less damage, but they'll also freeze you for a second, leaving you totally vulnerable to other enemies. Likewise, lighting elites will now spawn with full shields and attach lightning bombs to players. Additionally, to answer requests for a more direct way to earn Lunar Coins - which are used in one Risk of Rain 2 character unlock, among other things - this update added a five Lunar Coin reward to the Obelisk which appears after seven stages. This also gives the Obelisk another purpose, as it's basically worthless after you've reached it for the first time and unlock the Mercenary. Finally, the update tweaked and fixed the abilities of several characters. The Artificer and Huntress will now get much more mileage out of on-hit items thanks to increased proc coefficients (which determine how often on-hit effects can occur), and the Mercenary's Blinding Assault ability has been extended to three seconds so it works better with the rest of his kit. Those are the biggest changes in the update, but you can read the full list of changes here. Here's how to unlock all the Risk of Rain 2 items.